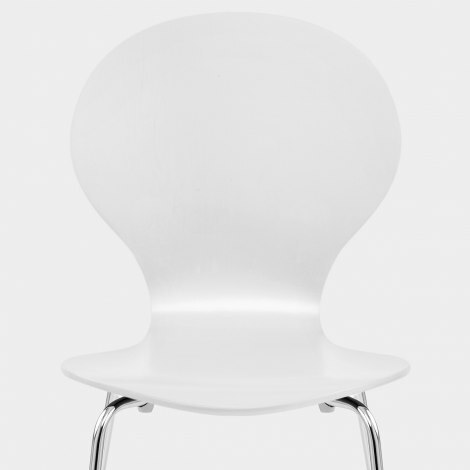 Modern and minimalist, the Candy Chair White is a great multi-purpose piece that is incredibly suave and stylish. A contemporary model designed to meet the needs of many interior settings, the Candy is a pristine yet practical piece of furniture. With a practical stackable shape, the solid wooden seat boasts a stylish satin white finish and chic rounded shape that is fashionably formed in a graceful curve. Four polished chrome legs descend to the floor, providing a strong and sturdy base. With small rubber plugs to help preserve a wide range of floor surfaces, the Candy is a much-loved design that will never go out of fashion. "They look smart and very happy"
Ordered two in white and they arrived promptly and were easy to put together. Nice white gloss wood which is easy to wipe down and looks good in our kitchen. Great service. Was texted a time slot and arrived as said. Packaged well. Very simple to put together. Bought them to replace chairs that were a little broken but the glass table was perfect. As these are wooden I felt that buying white was acceptable as they're unlikely to stain and look grubby but would remain looking clean as they were for my rental fiat. They look smart and very happy .